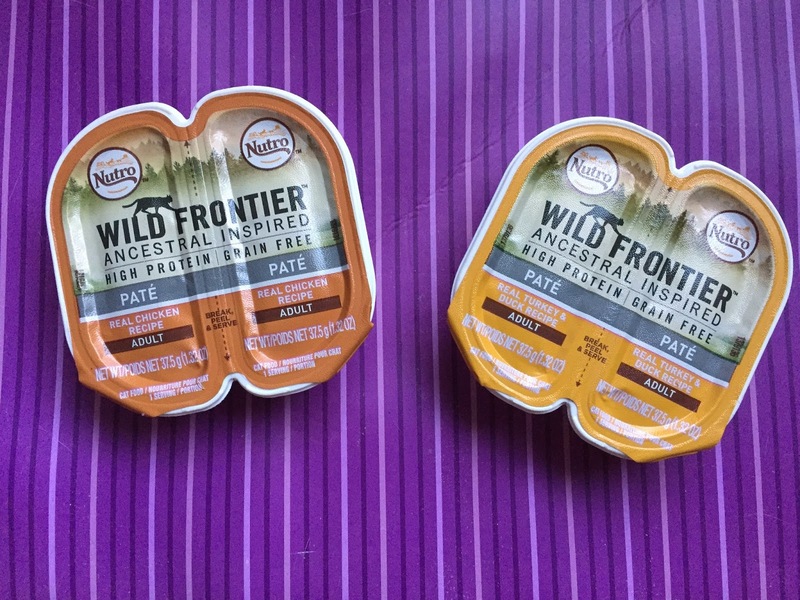 We got the variety pack of the Nutro Wild Frontier Pate, which included two flavors: chicken recipe, and chicken and duck. It's a grain-free food and there are no artificial colors, flavors, or preservatives, so that's a plus. The chicken recipe has chicken, chicken liver, and pork broth as the first ingredients; whereas the turkey has turkey, chicken liver, and pork broth. These trays are marketed as "perfectly portioned" and snap apart so one side can be used for breakfast and the other side for dinner. I thought this was a great idea, but was skeptical that the sides would snap apart cleanly. I also worried that snap would tear the foil and cause it to peel back on both sides. However, I was pleasantly surprised. The tray snapped apart easily and the foil was easy to tear to separate the two sides (I still do it gingerly, just in case, though). In short, it works and works well! We really like the two portions, so the "leftover" side doesn't require refrigeration. It makes mealtime easy and when I have someone watch KitCat it makes mealtime simple for them, too! A case of 12 twin packs (that's 24 portions) of the Nutro Wild Frontier Pate is currently $17.09 on chewy.com. That gives you 6 packs (12 portions) of the chicken and six of the chicken/duck combo. KitCat really liked the Nutro Wild Frontier Pate. 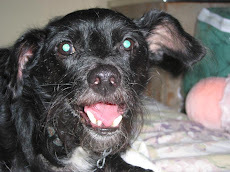 He preferred the chicken recipe (he'll eat duck, but it isn't his favorite). The chicken is available on it's own, too, so it's not necessary to order the variety pack if your kitty has a preference on flavors, too. Since we got this variety pack, we have reordered the Nutro in the salmon and tuna recipe. KitCat really likes that, too. There's also several other recipes, as well, that we plan to test out. 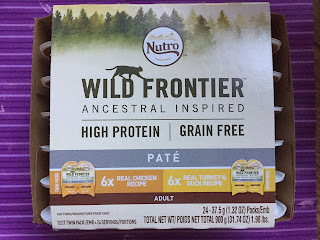 We give the Nutro Wild Frontier products four paws up. We can't wait to try the other flavors!